Contact address: Şerban Bălănescu, MD. Abstract: Purpose – We present the case of a 56 year-old patient with severe aortic stenosis (AoS), severe heart failure (left ventricular ejection fraction of 20%), in NYHA class III with permanent atrial fibrillation and type 2 diabetes mellitus, but no associated coronary artery disease. The local Heart Team decided to treat the patient by trans-catheter aortic valve replacement (TAVR). 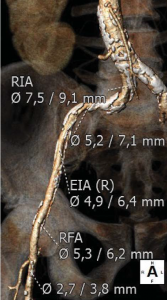 Consequently full imagistic assessment found that transfemoral approach was not possible, because of low femoro-iliac diameter on both sides and heavy calcifi cation. Transapical approach was considered. Methods – The patient was brought intubated to the cathlab under general anesthesia. Extracoporeal circulation was performed by cannulation of both right and left femoral vessels to partially sustain LV function during TAVR. Apical access was obtained by left minithoracotomy. A 29 mm Sapien XT valve was mounted without predilatation in the aortic orifice, expanded and postdilated once because of significant paravalvular leak. 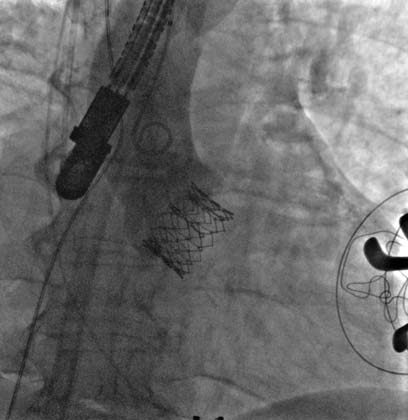 Results – The prosthetic valve was successfully implanted with minimal residual paravalvular leak. The patient was detubated early and discharged 7 days after TAVR. At one year follow-up he remains in NYHA class II, with persistent LV dysfunction and an EF of 25%. Conclusion – Transapical TAVR is a treatment option for patients with advanced aortic stenosis, severe LV dysfunction and no femoral access route. Keywords: aortic stenosis, transapical TAVR. Trans-catheter aortic valve replacement (TAVR) is an effective therapy for severe aortic stenosis in patients with high surgical risk1-3. The number of patients undergoing TAVR has significantly increased in the last years4-6 and the experience gained has created the prerequisites for a better selection of those who can derive a significant benefit from this procedure. In patients with severe aortic stenosis who are not suitable candidates for surgery, TAVR as compared with standard therapy, significantly reduces mortality rate and cardiac symptoms1. Also it is proven that TAVR in patients with severely impaired left ventricular (LV) function can be performed safely and it is not associated with an increased peri-procedural risk. This category of patients with severely diminished LVEF undergoing TAVR demonstrated a rapid improvement in LV function7. Among these patients TAVR improves significantly NYHA functional class when compared with patients with normal or moderately reduced LVEF8. A 56 year-old male patient with obesity (body mass index of 30.1 kg/m2, body surface area of 2.1 m2) and a history of permanent atrial fibrillation on oral anticoagulants, with type II diabetes mellitus on oral antidiabetic drugs and hyperlipidemia was referred to our Center to be assessed for trans-catheter aortic valve replacement (TAVR). He was declined conventional surgical treatment by several cardiac surgical teams because of significant impairment of the LV systolic function. On admission the patient presented with NYHA class III heart failure; he had previous NYHA class IV transient episodes. He never experienced angina or syncope. The ECG demonstrated atrial fibrillation and signs of left ventricular hypertrophy and strain in the left precordial leads. 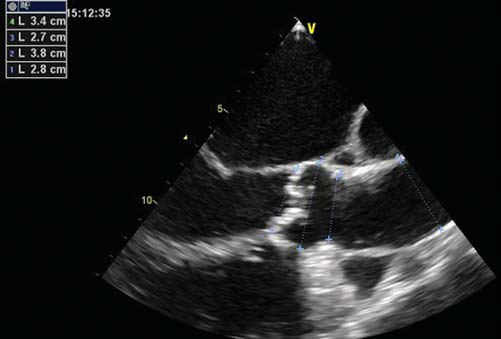 His echocardiogram showed dilated cardiomyopathy (LV end-diastolic volume of 195 ml) with severe impairment of the left ventricular function and an ejection fraction of 20%. His heart failure was due to severe calcified aortic stenosis with an indexed valve area of 0.47 cm2 /m2, and peak/mean gradients of 62/39 mmHg (Figure 1). He also had moderate-to-severe mitral regurgitation and severe tricuspid regurgitation with an estimated sPAP of 38 mmHg. He was considered at high risk for surgery due to the very poor left ventricular performance. Blood samples showed good renal function, moderate liver dysfunction consistent with congestive hepatic disease, long standing uncontrolled diabetes with high glycated hemoglobin (8.2%). NT proBNP level on admission was 10854 pmol/l. Trans-thoracic and trans-esophageal echocardiography were performed for the analysis of the aortic valve, which proved to be bicuspid, with severe calcifications, associated with a moderately dilated ascending aorta of 38 mm diameter and poor left ventricular ejection fraction (Figure 2). Coronary angiography demonstrated non-significant obstructive coronary artery disease. Multi-slice angio-CT of the entire aorta was performed for the assessment and measurements of the aortic root complex (valve and ascending aorta) and the ilio-femoral axis (Table 1). The aortic valve was confirmed as bicuspid with a raphe between the right and the non-coronary cusp and a single sagittal commissure. 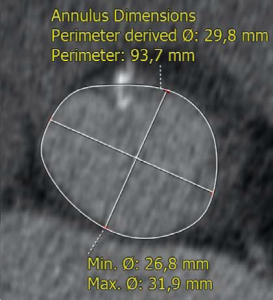 The aortic annulus had a minimum diameter of 26.8 mm and a maximum diameter of 31.9 mm, with a perimeter of 93.7 mm; the perimeter derived annulus diameter was 29.8 mm (Figure 3). The distance from the annulus to the ostia of the coronaries allowed the implantation of a balloon expandable valve. 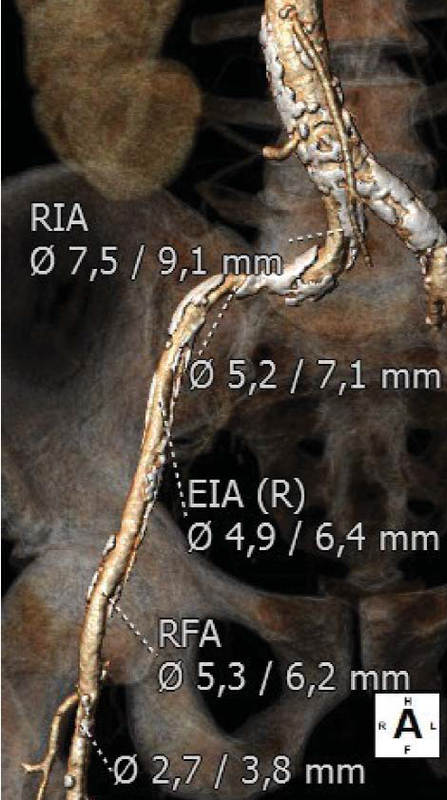 Both common external iliac arteries proved to be calcifi ed with an internal diameter less than 6.5 mm prohibiting the femoral approach with the classical 18 French TAVR sheath (Figure 4). 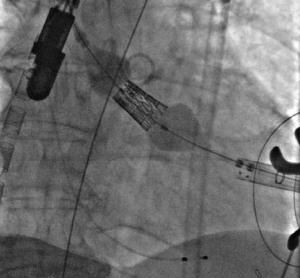 Accordingly, the Heart Team decided to proceed with TAVR using the trans-apical approach with a 29 mm Sapien XT trans-catheter heart valve system. The patient and his family were fully informed about procedural steps and about the age limit admitted in the guidelines that he did not fulfill at 56. Figure 1. Transvalvular aortic gradient (mean on multiple systoles – Figure 1A) and valve area by planimetry (Figure 1B). Figure 2. 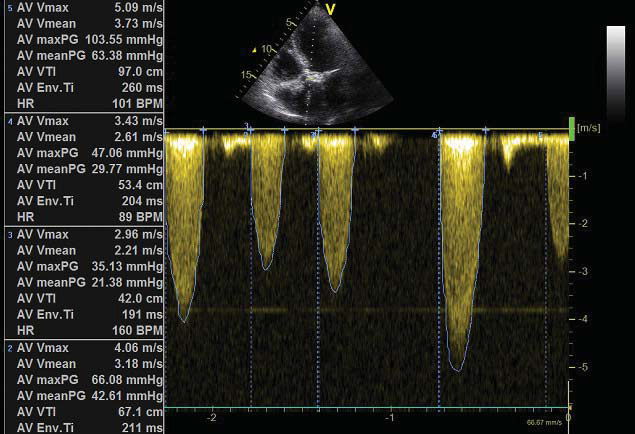 Echo measurements of aortic annulus, diameter at Valsalva sinuses and ascending aorta (Figure 2A). LV function – ejection fraction (Figure 2B). The intervention was performed in the cath-lab under general anesthesia, on extracorporeal circulation with a cardiac output of 50-60%, under complete heparinization. Arterial and venous cannulas were inserted first via both right femoral vessels. The decision to cannulate was taken to prevent intra-procedural severe LV dysfunction during valve deployment and LV manipulation, considering the low baseline EF. Figure 3. 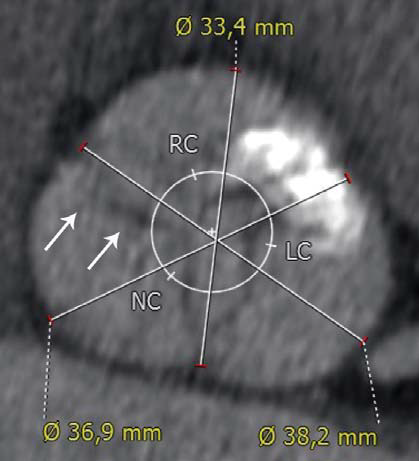 Angio-CT demonstrated a bicuspid aortic valve (raphe indicated by white arrows in fi gure 3A) and a dilated aortic annulus, superior to 29 mm (Figure 3B). Figure 4. 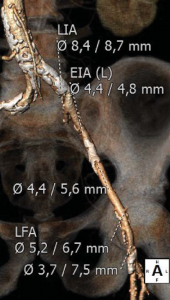 Angio CT demonstration of heavily calcified abdominal aorta and both ilio-femoral axis with reduced inner diameter (right ilio-femoral in Figure 4A, left ilio-femoral in Figure 4B). A 5F sentinel pigtail catheter was inserted by right trans-radial approach into the right Valsalva sinus. A balloon-tipped 5F temporary pacing lead was inserted into the apex of the right ventricle via the right internal jugular vein. The left ventricular apex was determined by TTE in supine position on the angiography table. Figure 5. The position of the trans-apical sheath of the Sapien XT valve delivery system in the LVOT with respect to right Valsalva sinus marked by the position of the pigtail catheter (black arrow). The venous cannula may be noted in the right atrium – superior vena cava (white arrows). The apex of the left ventricle was surgically exposed and prepared with 2 U-shaped epicardial bourses on the puncture site. The apex was punctured, a 6F femoral sheath was inserted in the LVOT and a 0.035” J wire was advanced into the descending aorta and then replaced by a stiff Amplatz guide-wire over a 6F JR catheter. We subsequently replaced the 6F sheath with the Sapien XT valve delivery system sheath (Figure 5). 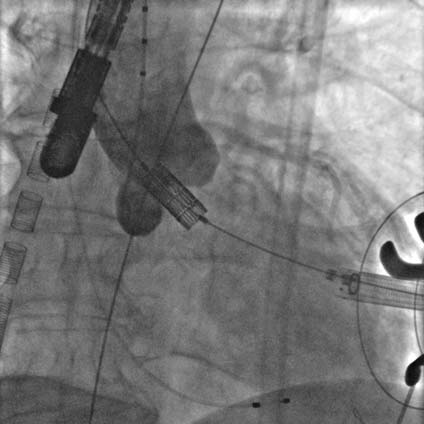 The 29 mm Sapien XT valve was advanced into the aortic valve via the apical mounted sheath; the position was repeatedly controlled by 10 ml contrast injections through the pigtail catheter (Figure 6). Figure 6. TAVR valve positioning at the level of the aortic annulus under angiographic control. Rapid pacing was initiated at 150 bpm and the Sapien XT valve was slowly manually expanded in the native aortic annulus with 31ml of contrast in the inflation device (Figure 7A). After valve implantation the angiogram and TEE showed a stable position of the valve with significant para-valvular leak due to underexpansion. 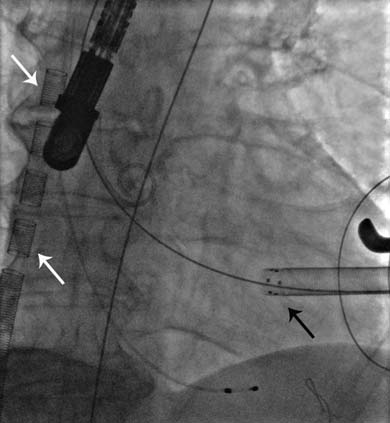 Rapid pacing was reinitiated and balloon post-dilation was performed with 33 ml of contrast for the optimization of valve deployment (Figure 7B). An optimal position and hemodynamics of the Sapien XT valve was achieved with mild residual para-valvular leak (Figure 8). Surgical closure of the apex and of the chest incision was completed. Figure 7. Progressive valve expansion (Figure 7A) and post-dilatation with a higher balloon contrast volume to optimize implantation (Figure 7B). impairment. He was discharged on a regular ward 24 hours after the procedure when the temporary PM lead was also extracted. He remained hemodynamically stable, without inotropic drug support, low IV loop diuretics and no pericardial effusion. 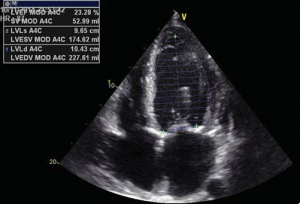 Transthoracic echocardiography before discharge showed that the Sapien XT valve had a good stable position, with a minimal para-valvular leak, associated with mild improvement of the left ventricular function, with a 25% ejection fraction. In the 7th day after the procedure and prior to discharge the patient performed a 6 minutes walking test for 260 m without any signifi cant symptoms. He was left on acenocumarol for a target INR between 2.0- 2.5, clopidogrel and low dose aspirin; triple therapy was considered for 6 months and acenocumarol and clopidogrel should be given thereafter. One year after valve implantation he remained in good clinical condition, in NYHA class II with a marked improvement of mitral regurgitation, but with persistent LV systolic dysfunction and a 25% ejection fraction. In this report we describe the first Romanian experience with trans-apical aortic valve replacement with the Sapien XT valve system. 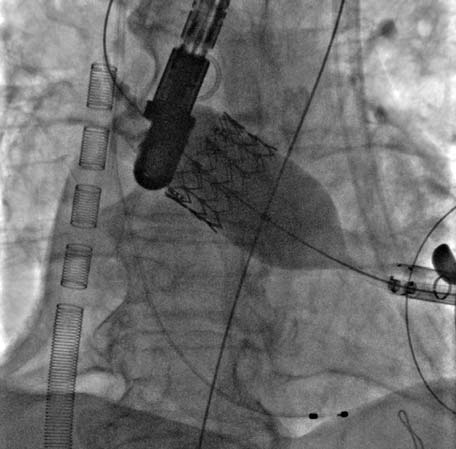 This case demonstrates the utility and feasibility of implanting a prosthetic aortic valve percutaneously by trans-apical approach in a patient with severe calcified aortic stenosis on a bicuspid valve, considered at increased risk for surgical aortic valve replacement due to severely depressed LV ejection fraction. TAVR was considered and performed in this case despite patient’s age, lower than 65. Figure 8. Final angiographic result, with optimal valve expansion and mild paravalvular leak. First, according to current guidelines TAVR should be considered irrespective of patient’s age if the decision to proceed with TAVR is fully accepted by the Heart Team and the patient (class IIa, LOE:B)9. In this category of patients with an ejection fraction below 20% surgery is often rejected and short term prognosis is very poor despite “compassionate-use” of TAVR10. 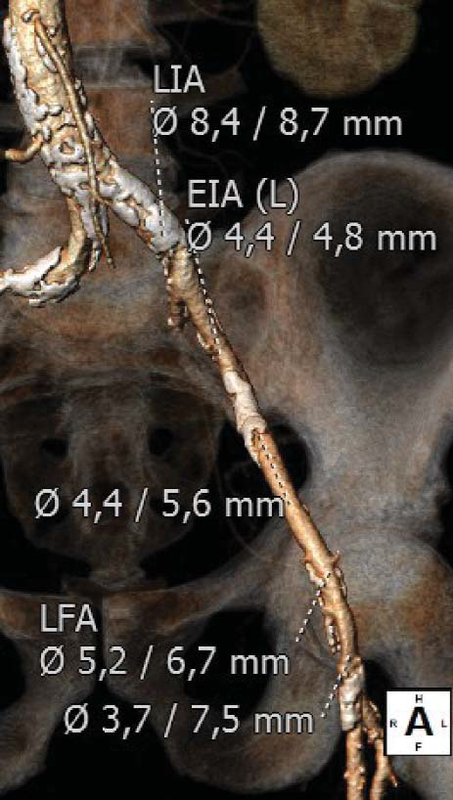 Trans-apical, anterograde approach was considered necessary because of the small diameter of external iliac arteries. It provided very good support for the deployment of the valve, an important issue for the bicuspid native valves, on which, due to their oval anatomy, a good position of the valve may be challenging to achieve. Alternatively, trans-aortic access was recommended by some experienced TAVR teams in cases with low LV ejection fraction, to avoid ventricular manipulation and risk of damage or worsening of LV function11. However no difference in mortality could be observed with both techniques12. We decided to proceed with trans-apical access backed-up by the support of partial ECC with arterio-venous cannulation in the cath-lab. The size of aortic annulus of 29.8 mm (perimeter derived), while the minimum and maximum size were 26.8 mm and 31.9 mm respectively were superior to the recommended size for both self-expanding and balloon-expandable valves of maximum 29 mm. We decided on the Sapien XT valve because of the possibility to over-expand the valve by adding 2-3 ml of contrast into the inflation device that proved necessary to post-dilate the valve. Thus no significant para-valvular leak was finally observed. Despite the fact that bicuspid aortic valve represents a formal contraindication for TAVR, recent studies describe similar device success and outcome in this anatomical situation when compared to tricuspid aortic valve13. Larger aortic annulus requires larger bioprosthesis size and oval-shaped valve orifi ce may result in uneven expansion with signifi cant para-valvular leaks. However careful implantation of an adequately sized bioprosthesis and post-dilated if necessary, leads to good procedural results13. The patient, as predicted by studies on patients submitted to TAVR with severe left ventricular dysfunction, had a significant improvement of symptoms, associated with the reduction of the mitral regurgitation and a mild improvement of left ventricular systolic performance. Conflict of interests: none declared. Funding: none. 1. Leon M, Smith C, Mack M, et al. PARTNER Trial Investigators. Transcatheter aortic-valve implantation for aortic stenosis in patients who cannot undergo surgery. N Engl J Med 2010;363:1597-607. 2. Adams D, Popma J, Reardon M, et al. U.S. CoreValve Clinical Investigators. Transcatheter aortic-valve replacement with a self-expanding prosthesis. N Engl J Med 2014;370:1790-8. 3. Mack M, Leon M, Smith C, et al. 5-year outcomes of transcatheter aortic valve replacement or surgical aortic valve replacement for high surgical risk patients with aortic stenosis (PARTNER 1): a randomised controlled trial. Lancet 2015;385:2477-84. 4. Webb J, Altwegg L, Boone R, et al. Transcatheter aortic valve implantation: impact on clinical and valve-related outcomes. Circulation 2009;119:3009-16. 5. Walther T, Hamm C, Schuler G, et al. Perioperative results and complications in 15,964 transcatheter aortic valve replacements. Prospective data from the GARY Registry. J Am Coll Cardiol 2015;65:2173-80. 6. Holmes D, Brennan J, Rumsfeld J, et al. for the STS/ACC TVT Registry. Clinical outcomes at 1 year following transcatheter aortic valve replacement. JAMA 2015;313:1019-28. 7. Linte A, Căldăraru C, Constantinescu D, et al. 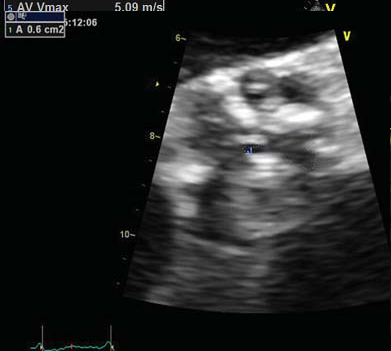 “Valve in valve” transcutaneous aortic valve repair for severe paravalvular leak: a case presentation and literature review. Romanian Journal of Cardiology 2014;24:34-40. 8. Pilgrim T, Wenaweser P, Meuli F, et al. Clinical outcome of high-risk patients with severe aortic stenosis and reduced left ventricular ejection fraction undergoing medical treatment or TAVI. PLoS One 2011;6:e27556. of the American College of Cardiology/American Heart Association Task Force on Practice Guidelines. Circulation 2014;129:e521-643. 10. D’Onofrio A, Salizzoni S, Agrifoglio M, et al. When does transapical aortic valve replacement become a futile procedure? An analysis from a national registry. J Thorac Cardiovasc Surg 2014 148:973-9. 11. Dunne B, Tan D, Chu D, et al. Transapical versus transaortic transcatheter aortic valve implantation: a systematic review. Ann Thorac Surg 2015;100:354-61. 12. O’Sullivan K, Hurley E, Segurado R, et al. Transaortic TAVI is a valid alternative to transapical approach. J Card Surg 2015;30:381-90. 13. Mylotte D, Lefevre T, Søndergaard L, et al. Transcatheter aortic valve replacement in bicuspid aortic valve disease. J Am Coll Cardiol 2014;64:2330-9.